The Bovada $5K daily morning tournament is a pretty decent bang for the thirteen buck. Slow-ish structure and plenty of play. In the first 40 online tournaments since I got back from my last trip to Las Vegas, I cashed eight times and made final tables in five tournaments between 150 and 500 entries. Just got to translate that to something big. I opened my first hand of play to 120 and got four (4!) callers. The T♣2♣8♥ flop fell on both sides of me, but with that many other players in the mix, I was probably out-paired on the ten. 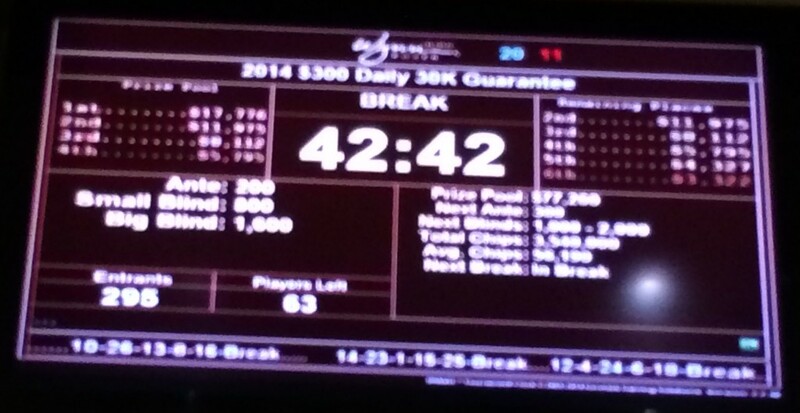 SB bet 300, I called along with UTG3, and the turn was Q♠. SB led out with a bet of 600 (holding [tj]J♠ for the pair, with straight and flush draws), and I folded, along with UTG3 (6♦6♣). UTG2 raised to 140, SB called, and I (uncharacteristically with this hand) called.The flop was checked around, SB (Q♣A♥) bet 140 on the turn with the board reading 3♥Q♠A♣9♥ and I was out of there. UTG2 called with K♠T♠ but folded to a bet after missing the straight on the 7♣ river. The early downward slide continued with what would have been the best hand. UTG1 limped in with TxQ♠, UTG2 raised 6x to 240 with A♣K♥, I called, and UTG1 stayed in. I folded to a bet of 360 from UTG2 on a flop of 8♣8♥J♠, but UTG1 stayed in and battled through the 6♠3♥ on the river. UTG1 pushed 1,140 into the pot with queen-high and the pair on the board and pushed off the ace-king. It’s okay. I made up for it later. This isn’t a hand I’m usually playing from this spot, but it worked out well. I opened to 100, getting calls from CO and BB. The flop was Q♥9♦5♥, giving me middle pair and a flush draw. BB checked, I bet 140, and CO raised me to 740 with two pair (9♣Q♠). BB’s 6♣5♠ timed out to a fold, and I made the call. The A♥ peeled off on the turn and I checked my fourth-nut flush. CO bet out another 900. We were almost even in chips, and I bet my remaining 3,360, which he called. I was fortunate that he hadn’t been playing AxQx, because the A♠ hit the river, but my flush held and I took an early chip lead in the tournament. It seems almost unfair to give me aces the hand after double up, but I opened to 120, HJ—who was the player I’d doubled through—called (9d tc]) with only 340 behind, and CO tried to make a steal with J♠Q♣ by three-betting to 540. I four-bet to 2,500, HJ went allin, and CO folded. The board ran out J♦K♣Q♠T♠7♥, I had the higher straight. I open to 180. UTG3 calls. BTN calls. The flop is A♣4♥2♣. I check, UTG3 checks, and BTN bets 240 with 9♥9♠. I call, and UTG3 with 5♠5♣ for the straight draw calls. Another A♥ on the turn and I put the others to the test with a bet of 400. The straight draw folds, but the moines are unbelievers. We both check the 6♣ on the river that makes a flush possible, but my better two pair is the winner and my chip count is over 10,000. UTG1 limped in with 7♦8♣. UTG3 likewise with 9xK♦. CO has an actual hand (A♦J♥) and raises to 400. I re-raise to 1,500, the limpets fold, and the big ace calls. The flop is about as good as it gets for me: Q♥5♠K♥. I check to set a little trap and CO checks behind. I’m not crazy about the A♠ on the turn, but I bet 1,200 anyway, getting a call. I bet another 2,500 for the river 4♣ and get another call from the pair of aces but my set of queens is still good. You hate losing a big chunk of chips to classically bad hands, but that’s what happened on this hand. UTG2 T♥8♠ limped in, and I raised to 300, getting calls from BB and UTG2. The flop is K♥3♠3♣, I bet my two pair for 480, BB calls. 3♦ on the turn and what’s the chance BB has a better full house? J♣ on the river, I bet 1,000, he shoves allin for a total of 2,730, and with 3:1 pot odds, I have to call. Naturally, he has J♥3♥ for a super boat. Same hand, same position, one round later. How weird is that? UTG1 limped in with 9♣T♠ and CO raised to 650with J♥J♠. I called. It was checked to the turn with 6♦6♣2♥2♦ showing, CO bet 800 and took the pot. I’m still near the top of the tournament leader board, but this hand isn’t one that helps me get back on top. I open to 600 and both blinds call. They’re both ahead of me. SB has Q♠J♥, BB has 6♠A♠. SB checks his two pair and BB checks his top pair on the Q♥J♣A♥ flop, I bet 800, SB calls, and BB probably kicks himself after folding when the A♦ appears on the turn. I don’t get an eight or a king on the river (5♦) and lose the hand. When you play bad hands, you have to expect to get outplayed. UTG2 and BTN limped in and I came along with my ace. The flop was an unpromising T♠K♣3♠ and everyone checked. I caught third pair on the turn 6♠, but when BTN bet pot-size for 800, I folded. He had 4♠4♦. BB had 9♦A♠ there, I don’t know what he was thinking, apart from perhaps he was under the starting stack. S’all good, because every chip he saved, I’d take on the next hand. The Mutant Jack is back! UTG opened to 1,300 and I put him allin, misreading his 7x raise as a small pair. It was Q♥Q♦. But I caught my ace on a board of 8♠A♦6♦8♦T♠ and popped back up the leader board. I raise and get a call from the SB’s J♥T♥, The flop is J♦8♠K♠ and I bet and he folds second pair. I’ve gone through an entire level without playing a hand, there are only seven players at the table, and while I might often fold eights pre-flop in a full ring, here I’m opening with a raise to 900 to take the blinds and antes. The eights seem appropriate for the hand. I’m moved to a new table. I open to 900, called only by BB (Q♦A♠). I c-bet the J♣5♣4♦ flop and BB—apparently very cautious— folds to the bet of 1,000, which represents about a fifth of his remaining stack. Another new table. UTG raises to 1,200 with 2♣A♥ and I smooth call. The flop has an ace, but it’s 4♠5♠A♠. I pick up two pair on the turn T♥ but that’s likely irrelevant on the K♠ river. we both have aces, but no spaces, and check it down to my win. I raise and everyone folds. Raise and folds. So sad. But the win puts me over 20,000. It really has been a great run of cards. Another raise where nobody calls. Raise and folds. UTG2 dropped A♥J♣ even before I bet. So strange. A massive hand. I open to 1,500 and get a call from SB, who has about what I have in chips. We’re HU to the 5♠J♥8♠ flop and I bet my top and bottom pair to 1,800. SB raises to 4,100 and I just call. There’s more than 12,000 in the pot. A 5♦ hits the turn and while it’s possible there’s a five in SB’s range, I discount it. He makes a bet about a third of the pot size, which I call. The river is 8♦. Maybe he has quads, maybe he doesn’t, but he shoves the river for nearly 10,000. I call, and am relieved to see he just has Q♠A♣, and he apparently didn’t think I connected with the board. I gain over 20,000 chips. I raise, get a call from BB (J♠A♠) and my c-bet takes it down on a flop of 7♣8♥7♦. I reraise UTG3 pre-flop and he folds A♠J♦. This propels me back to the top of the leader board for a while. UTG3 min-raises right in front of me and I just smooth-call because sometimes I like to see what the flop brings with jacks (UTG3 has A♦5♦). The largest of the four stacks behind me has half my chip stack, and the others are less than a quarter each, so whatever happens, I’m safe. CO goes allin for 6,630. SB just calls, with 14K behind. It’s too much action for UTG3, but I call the allin. Counting the dead cards from the other players’ hands, I’m a 68% favorite to win the whole pot. The flop is 3♠7♦8♠ and SB shoves. I call and he has 9♦9♥; CO has 4♠4♦. I’m up to 79%. The Q♥ on the turn pushes it up to 90%. The river 8♠ knocks both players out and I gain nearly 30K. I raise to 1,800, UTG3 comes along for the ride, and HJ calls with barely that much behind. The flop is 8♥4♣8♠, I bet 2,000 and UTG3 3♦3♣ drops out. HJ raises me by 71 chips with Q♦Q♥ and I pay him off. Still comfortably in the lead; the two largest chip stacks at my table have under half my stack. I make my usually raise to 1,800, getting calls from UTG2 (J♥A♣) and BTN (2♦2♣). BTN is the larger of the two stacks, with about 13K. The flop is 5♠3♥5♥, I c-bet 2,500, the other ace folds, and BTN shoves for another 8,300. I call and pick up a useless straight draw on the turn 4♦, but a 3♣ river counterfeits his low pair and he’s out in 122nd place. UTG min-raises with A♣4♠ and about a third of my chip total. I’m the only caller. We both flop top pair with A♥9♦5♦. We checked the flop together, I called his bet of 1,200 on a 2♠ turn and a bet of 1,800 when his straight failed to materialize on the K♠ river. My kicker was good enough to play and I took the pot. I actually started with the best hand here. No aces, no pairs, and the other king was unsuited with an inferior kicker. I raised to 2,400 and everyone folded to the big stack. The closest competitor at the table was below 30K. Open-raise and win. BB had the Brunson. I called a min-raise from CO and hit bottom pair on a A♦T♦J♣ flop, calling a 2,225 c-bet from him. He had only about 9K left, so when the Q♣ made my straight, I shoved allin,, he called with K♠7♣ (seriously?) and we split the blinds and antes after the K♣ river made our own kings irrelevant. UTG2 shoved allin as an open for 10,800. Action folded to me. The dealer had 20K and the blinds each had half that. I called, everyone got out of the way and I was up against J♥T♥, which wasn’t quite good enough on a board of 7♦6♣5♦9♦9♠. The chips put me up over 100K just as I was moved to another table. A big hit. I raise to 2,400 and, maybe a little cocky, call an all-in raise from a stack of almost 30K. It’s a race, he has 8♥8♣ and while I almost make a straight on the river, his pair holds up. I’m still in the chip lead, but not by much. Went into kind of a quiet time there. Got passed up on the leader board by several people pushing up as far as 130K, but I was still up there. Both my big blinds had been walks. I raised this to 3,600 and everyone folded. How’d this hand get in there? BB is how. I did one of my few BB defends to a min-raise from BTN. I hit middle pair on the 8♥5♦Q♠ flop, and check-called a bet of 3,600 for some reason.We both checked the K♠ turn. Another queen (Q♦ hit the river and I check-called 6,780. Why? I do not know, but I’d been good all the way against 7♣6♥. I guess he did have an open-ended straight draw, but blowing half your chips on that board with those cards? UTG limped in and I just called. The flop was Q♣3♠3♣, BB checked, UTG bet 3,300, and I raised enough to put both of them in. BB folded his T♥7♣ and UTG gave up on his A♣4♥. Another little quiet period. We’re 7-handed at the table and I raise a little wider than normal, taking down the pot. Quiet time is over. I defend my pair against a UTG raise to 6,000 and a call from UTG1. The flop is kind: 4♣Q♥6♠. UTG1 is the stack I have to worry about at more than 70K. UTG has less than 20K. I donk-bet 10,000. UTG has to put in all but 3K to call, and he shoves with 9♠9♣ UTG1 drops his 8♠A♦ and I open the set. 7♦ on the turn and K♣ on the river and I’m back in the top ranks. I’m near the top of the leaderboard, but there are still people ahead of me, including the BB at our table who has over 150K. So I’m being cautious with this hand. I open to 6,000 and get a call from HJ, who has A♠J♦. We’re heads up to the 5♣4♠7♥ flop. I c-bet 10,000—about 20% of his stack—and he folds. Action folds to HJ who shoves all-in with just 11K and I call. He has K♠J♥ and doesn’t catch up. ‘Mom & Pop’ in the blinds seemed to be the hand of the moment. UTG3 started off the action with a limp, then HJ raised to 7,150, getting a call from CO and me. When things got back around to UTG3, he called the extra. The flop was a juicy but dangerous K♥A♦Q♦. All of the players in the hand had more than 100K, and one of them had me covered. UTG3 checked, HJ (who had me covered) raised to 12,005 (so cute!). CO folded J♣J♥, I called with two pair, and UTG3 folded. CO was probably kicking himself when T♠ hit the turn and HJ and I checked. I probably would have had to fold to an all-in of more than 110K and missed the river K♣. I bet 25,000 and HJ folded 8♥A♠. UTG3 had originally called with 4♦6♦. A loss! I raise and BB calls with the chip lead (260K) and T♠T♣. The flop is way out of my range but hit him incredibly hard: 2♠4♠T♦. We check it, he bets the 6♣ turn but I don’t bite. I will point out that this is the third time I have ace-queen in seventeen hands (luckbox). We’re seven-handed again. SB has 49K, BB and UTG have about 145K. HJ has 13K. CO is the big stack with 270K, and BTN has 250K. I make a standard raise to 15K. Action folds to BB, who shoves almost 30BB. I call against his 8♣6♣, hit an unnecessary queen on the river and almost double up, back into the chip lead. HJ min-raises with 2♥8♠ and I defend my blind. I call a bet of 11K on the T♥K♣[ jd] flop, then we check it down through the 7♣ and get to a Q♠ river. He bets out 33K and even with two pair, I can’t call against a possible straight. I wuss out and fold the Portland Nuts to a bluff. There are only six players at the table at this point. I shove over an all-in of less than 44K, he has Q♦9♠ and if a 7x had hit the river instead of a second 5x, his nine would have improved an eight-high straight on the board. Tables have consolidated and my current one is down to eight players already. I make open the action pre-flop here to take 11K in blinds and antes. I normally wouldn’t defend this hand, even in BB, but I call a min-raise from UTG1 and then fold to a bet on the 2♣2♠Q♣ flop, which is good, because he has Q♠A♦. We’ve lost another player, but his chips were gobbled up by UTG, who’s now the table chip leader. I open this hand and win. Red nines again in just eleven hands! Not as good for me this time, as I call a raise of 18K from short-stacked UTG for a quarter of his chips. CO calls and we’re off to a flop of Q♣7♣8♦. UTG and I check, then CO bets a third of his stack for 27K. UTG jams his last 68K in and I am gone. CO calls with Q♠A♥ and two more aces peel off on the turn and river. Six-handed. I open to 18K, BTN calls with 9♥9♠, I check a Q♣5♠7♦ flop and he bets 20K, then folds to a raise of 40K. I defend to a min-raise from BTN and fold to a bet on a flop of A♥3♥J♠. Stupid defense. At last! A hand I can do something with! UTG1 shoves for a bit over 15BB with K♣J♣ and I make the call. The board is 7♣T♥5♥Q♦6♥ and I make a pair for the win. UTG opens to 20K with Q♣T♥ and is lucky SB disconnects with K♠A♠. I call, but the K♦2♣9♥ flop isn’t my bag and I fold to the Portland Nuts. Not aggressive enough. Down to five. UTG limps in, then calls my raise to 25K. The flop is 3♦T♠K♠ and he checks his 2♣2♠. I bet 30K with overs and an open-ended straight draw, and he folds with about 120K left. I raise the small blind and BB lays down A♣2♥. We’re down to one at this point and action is once again nine-handed. I’m a close second in chips at the table, with two stacks around 250K, and the others 200K and below, though nobody’s incredibly short. Actionfolds to me and I get a walk. I raise and take it down. BTN raises to 24,000 and both of the blinds (including me) call, so there’s a healthy pot brewing with 80K chips already. That’s half the size of what the other two players in the hand started with. The flop is A♦2♥T♦ and BTN bets 40K at it holding 9♠T♠, with me calling for the Broadway draw. BB drops out figuring his 7♥5♥ isn’t going anywhere. I gamble on no flush with the J♦ in the turn and shove. BTN folds. I’m over 500K. SB open-shoves 175K with 7♠7♥ and I knock him out, making an unnecessary full house to push me over 700K. I have the chip lead by 300K. Seats 1 and 2 have about 400K, seat 3 is at 135K, seat 4 has 215K, I’m in seat 7, seat 8 has 145K, and seat 9 is at 260K. Another big blind defense I should have just tossed. SB limps in with A♣5♣, the flop is a tempting 8♣Q♠J♦, we check the flop, the turn is A♥, I call a bet of 10K, and then fold to a bet after 8♦ hits the river. Raise to 30K and win. Possibly the hand that cost me the win for the tournament. Chips among the hoi polloi have spread out a bit, so even though I’m not at what I had at my peak, I’m still 300K ahead. At least, I am at the start of the hand. We’re down to the last seven players. I raise and call a three-bet from SB to 80K. The flop is 5♣4♣9♣, and with no club and my best possible hand a very thin draw to trip kings or jacks, I fold to a bet of 177K from the Q♣Q♠. Then again, maybe it was yet another stubborn big blind defense. SB raises to 31K with A♦7♠ and the flop is 5♠9♠3♦. Now, I do have bottom pair here, so maybe there’s a rationale for me to call another 33K, but when the 2♠ shows on the turn, that doesn’t look like such a grand idea, and I fold to a bet on the J♠ river. Only 60K separating me from the next-biggest stack. Just six players. I open with my ace and win. I open, call a three-bet from BTN to 77K, flop 8♣9♠[ 4d] and fold to an all-in from K♣K♥. Down in the mud with the rest of the gang again. Five-handed. Seat 1 is up to 400K, seat 3 is at 435K, seat 4 is the leader with 715K, and seat 9 is on the bottom end with 290K. I open with my tens and win the hand. CO has a Q♣ but that’s the only card in any hand above a 7x. I win. I open 3x and call a re-raise from BTN to 80K. The flop is 9♥3♠5♠, I check-call 100K with nothing. Turn 2♦ and more nothing. BTN goes allin, I call, he has A♠A♣, I hit a K♥ on the river, and I’m in last place with 10BB. I open-shove and take the blinds and antes. Seat 1 is at 385K, seat 3 is at 320K, seat 4 has crested 800K, and seat 9’s sitting on almost 600K thanks to me. I shove and get no callers. CO (seat 4’s chip leader) min-raises with 8♠8♣ and I shove. He calls, the board runs out scary with mostly low cards and three spades by the turn, leaving me to catch a non-spade pair on the river, which obliges with T♦ and I double up. The (former) chip leader and I get into it again, with me raising , him shoving 9♦9♥ and me calling, to hit a ten on the flop and a flush draw by the turn. The pair is all I need, and I double through him a second time in three hands. He picks up another mid-level pair on the next hand, which finally holds, and cripples seat 1. Seat 1 is eliminated on the previous hand, so we’re down to the final four. Seat 3 has 645K, seat 4 has 490K, and seat 9 has 540K, so I’m back in the lead for a moment. I raise to 60K on this hand, CO calls with Q♦J♦, but folds to a 70K c-bet after a flop of 6♠3♥4♥. BTN raises to 40K with 6♣8♣. I call, and BB calls with 8♠7♠, so we’re both ahead of the original raiser. The flop is 4♦2♣3♠, giving BTN a gut-shot straight draw, I check without even a heart on the board, BTN bets 57,450 and he takes the pot. I’ve got 57% equity there. Grrrr. I’m not the chip leader or even second in chips at this point. But I like this hand and raise it into the only smaller stack in BB. The flop is 5♥Q♠A♣ and I bet 75K on my draw, then call a total of 180K. 8♣ on the turn and he shoves another 144K. I fold. UTG min-raises with J♦Q♦, I call, and BB comes along with A♣7♥. The flop is 8♥9♥4♣, BB checks, UTG bets 57,600 and wins with the worst hand and chutzpah. Everyone else is normalized between 600K and 700K. SB min-raises with 7♦7♠, I call, and fold to a bet on a 4♦4♠Q♥ flop. BTN raises with 7♠K♦ and I shove for less than 9BB. BB calls and BTN folds. I’m HU v 9♣9♠. The 5♦8♠Q♠ flop gives me a lot of hope (and practically dead-even odds), but no five, ace, or spade shows up and I’m out. Six hours, 411 hands. VPIP: 20%. 4th of 452 entries. +3,240% ROI. UTG2 min-raised, and I called along with SB. BB raised to 448. UTG2 dropped his hand, and I called, figuring either a big or small pair. SB folded and the flop ran out 8♦9♠9♦. BB bet 558 and I piled my trips into him. He called with A♦A♣—a 7 to 1 underdog until the A♥ hit the river—and I was gone. Twenty-two minutes, eighteen hands. VPIP 22% (as if it mattered with that few hands). After getting busted by a geezillionaire at the Wynn, I took advantage of the only reason to come to Vegas in the summer—the huge number of tournaments each day—and headed across the street to the Venetian to late-register one of the satellites to their penultimate tournament of the summer Deepstacks Extravaganza. Yes, I know it’s Sheldon Adelson’s property. Tweet me. I was alternate 76 for the night, and wasn’t going to get in before the level after the break, which came up not long after I made it to the desk. I had to wait for another ten minutes or so into the level, then got to work hanging on for dear life. And it worked! I’d been disappointed that the DSE wasn’t running as many Survivor tournaments as they had the previous year—not that I would have gotten an opportunity to play them this summer, things being what they were—but I would have preferred to play them instead of a satellite. Take the cash and go home. Two-thirds of the field of 153 was gone by the four-and-a-half hour mark (about an hour less for me since I late-regged). Coming in late, I was under average for most of the tournament, with only 20BB and the average at 33BB. Another eighty minutes and I hit the jackpot with AxAx over KxKx when I had just 12BB, with just ten players to go before the money. I got aces again just twenty minutes later but they didn’t pay a big pot. At a quarter to one in the morning, after nearly seven hours of the tournament, we were on the bubble. 23 players were getting seats to the $1,100 event, and the 24th player was getting $98, just under half the satellite buyin. One of the players proposed that the remaining 25 players chip in $5 cash each for the bubble, which would make up the remainder of the buy-in. I did it, but the irony, of course, is that if only 10% of the seat winners made it through to the money in the $800K, the bubble boy would be making—or at least losing less—than about 20 of the seat winners. Most of the other players contributed, one of the three tables only had two contributors, ironically it was the one with multiple short stacks. After the satellite, it was back to the Quad to sleep and struggle with the wifi, which only got worse after my first post for the trip. The morning before the game, I met up for coffee with Toma Barber (@AfroSamuraiLV), who’d sat next to me close to the money at the Deepstacks Main Event last fall, and made it to the final table after coming back from an extreme short stack. Since I try to make maximum use of my short trips to Vegas, it’s tough to meet up with people, but it’s obviously essential to building a poker career, and Toma was a great source of info on WSOP.com (which would have been more useful if the wifi had been working, natch). After leaving Toma, I wandered over to the Venetian and found my spot at the table closest to the main entrance to the casino. Things got off to a great start, with me winning two of the first three pots, but twenty minutes in I lost a big one when the board straighter out on the turn to crack my top two pair and I couldn’t improve. By the end of the first 40-minute level, though, I’d made up the deficit and a little bit. I was in seat 7. Seat 5 could easily have been the inspiration for the Milton Waddams character in Office Space, if Milton was taller, weighed more, had scabby arms and unshaven jowls, a constantly twitching chin that jiggled said jowls, and had used his money to enter the WSOP Main Event for several years instead of complaining about the service on Caribbean beaches. He was one of those constant sotto vocé talkers at the table, muttering both to himself and others throughout hands and after. I say this with the full acknowledgement that he may be a great player, for all I know—I ended up losing to him, as did a number of other players—but seriously, it was almost comical. I almost hope to see him make a major event final table one of these days, just to see how ESPN or the WPT production companies could handle it. By the first break, I was back down to T8,600 chips. Over the next hour-and-a-half, I maintained, and was down to T8,000 four hours in. Blinds were 150/300/50. Milton limped UTG, I raised to T1,500 with K♥J♠, and action folded back around to Milton, who hemmed and hawed for about two minutes, despite having me covered by more than T20,000. I don’t know if it was an act or what, but when the flop hit KxQxQx, I certainly didn’t put him on anything that was as strong as AxKx or AxQx, so I bet the king after his check, he called with AxQx, and with no king on the turn or river, it was over. Three hours and forty minutes. Around 370th of 526 entries. I headed down to Harrah’s and caught the shuttle to the Rio to late-register for the $235 Deepstack. Entry numbers were down significantly for the Deepstacks, with everything behind the WSOP except for the Main Event. The Pavilion Room registration cage where there had been long lines for both satellites and the DS events two weeks earlier was only had two windows open to process tournament entries and three people in line for those. Still, top prize in the 3pm tournament was about $28,000. My first table was all late-registrants, drunk or just exceptionally garrolous Brits, mostly. And play there was loose and alternating between slow and fast, with conversations about the World Cup, which part of London they were from (for the ones who hadn’t signed up together), and how much they’d drank the night before. It didn’t take long for us to break into the main body of tables, and I picked up a few chips at that point. The killer hand for me was about an hour-and-a-half after I got to the Rio. I had T18K at 200/400 and JxJx. UTG put in a small raise and I 3-bet to T2,500. Original raiser calls. The flop is 9x6x4x, no flush draws. I shove, and the original raiser calls with A♥7♥. It looks good until the river ace, and I’m down to T3K. Within twenty minutes, he’d given most of his chips away on a gut-shot straight draw. I managed to double up once, but was out just a few minutes later. Two hours. 550th of 736 entries. Since it was bang-on 6pm, I walked back over to the cage and got into the secondary WSOP daily. It didn’t last long. I was down to about T5K forty-five minutes in, raised to T300 with KxQx UTG and got calls from UTG1 and BB to a QxTx5x flop. I opened to T800 after a BB check, got a call, then BB raises to T2,200, I jam, UTG1 re-shoves for a starting stack, BB open-folds Qx4x, and UTG1 turns over 8♠9♠. A Tx hits the turn to make me top two pair, but the river Jx reduces my 80% equity at the time I went all-in to 0%. Forty-five minutes. Around 120th of 137 entries. BP had been urging me to get over to the Orleans for their bounty tournament. $100 buyin including $25 bounties. I managed to get over there from the Rio just before the break. I cracked kings twice in this tournament. The first time, I raised to T900 UTG with Q♠T♠ and called a reraise to T3,800 with just T4K behind. The flop has two spades, I shove, the guy flips KxKx, and I catch a spade. Unfortunately, after that, I was soon down to T5,100 after losing a couple of hands and then blinding off for an hour. I shipped for just over 10BB with 8x8x in late position and an older gent with a large stack and KxKx called from the BB, only to lose to my turned set. On the very next hand, I shipped again, and the guy who’d had the kings called with his own 8x8x, but he just doubled me up another time, and I was at T24.5K. About three hours into the tournament, I took my first bounty with queens against jacks, then grabbed another at the final table before I became a bounty myself. Six hours. 6th of 94 entries. 2 bounties. 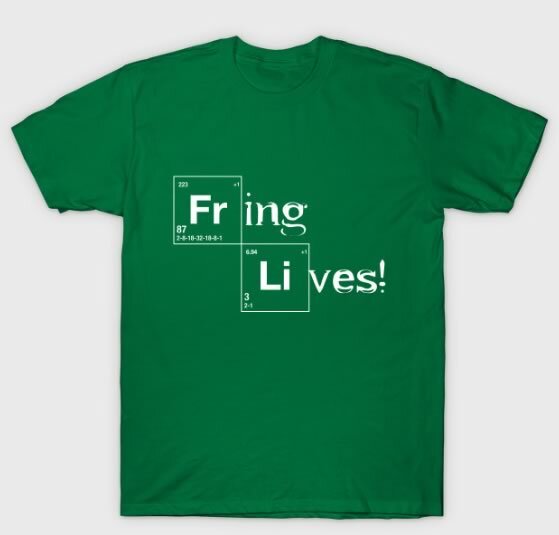 +254% ROI. Got a couple hours of sleep, then got up at 6:30 and started another poker day. Had a pancake, egg, and bacon breakfast at the Hash House a Go Go in the Quad, thought about buying direct into the final entry day of the $800K, then decide to manage my bankroll a little better and not. So I walked across the street to Caesars Palace new space for their poker room (not really a “room” any more) and bought into the fast-structured morning game there. Less than ten minutes into the tournament, I open with K♣T♣, flop middle pair, Broadway, and straight draws, and can’t make any of them on my draws, which costs a bunch of chips, and then I bust. Violating my Prime Directive, I rebuy. Half an hour later, the same guy I lost to with the clubs has lost some chips. I pick up A♦A♥ and 3-bet an early-position raise, my (short-time) nemesis goes all, in, the original raiser folds, and I call against A♣2♣, which flushes out on the turn. I’m out in short order after losing most of my chips. This time I don’t rebuy. Forty minutes. 16th of 23 entries. Despite the fact that I almost always stay at The Quad (what can you say about a hotel that picks a name that evokes student housing? ), until this trip, I’d never actually played in their poker room. Not that, from most of the times I’ve walked past, that there’s been much going on in their poker room. But there were no cash games started up at Caesars Palace yet, the wifi in my room wouldn’t let me get on to WSOP.com, and Bravo Poker Live said there was a single table of 1-1 NLHE happening downstairs. Not my finest hour (or whatever) of poker playing. I bought in for $200, but the play was crazy. There were a couple of seemingly-drunk Europeans passing money back and forth before they were giving it away to a couple of hit-and-run artists. It was nutty enough that one guy sat down with a couple of racks, then stood up after folding one hand. I got myself caught in the crossfire a couple of times, lost almost everything, climbed back a way, then got out while the getting was good. As BP wrote me: If u can’t beat a $1-$1 game at the Quad u should just quit. I walked next-door to Harrah’s to catch the shuttle to the Rio for the afternoon Deepstack. It was Day 3 of the Main Event, the buzz was all about Phil Ivey having the chip lead at the start of the day, but the buzz was pretty quiet, because there number of people actually at the Rio was dropping like players in the Main Event. The cage in the Pavilion Room was completely closed, without even a sign directing people to the main registration cage out the door and down the hall. I got signed up and headed to my table, which was a good bit less rowdy than the night before. I roller-coastered for a few hours, more than doubling my stack after one-hundred-and-fifty minutes, then sliding back under chip average as we neared the second break. The fast structure meant the chip average after break was just 20BB (M=7.25). I had an M just over 5. Even with the reduced number of players (659) top prize was still about $25K. Then I busted the first hand after the break. Four hours and thirty-five minutes. Around 310th of 659 entries. Grabbed a cab over to the Orleans to once again get under the wire for the Omaha Hi-Lo bounty tournament ($80 buyin, $10 bounty). Didn’t go anywhere, didn’t get any bounties. One hour and forty minutes. 62nd of 87 entries. I wasn’t done playing Omaha. I got on the list for 4-8 with a half-kill, got sat down with a couple hundred dollars in chips, and proceeded to double the size of my chip stack over the course of ninety minutes. Then I headed back to the Quad after grabbing a late dinner at T.G.I. Fridays. It was my last night in town and I was restless. I wasn’t going to be able to play anything major on Friday before I had to go to the airport at 6pm, and looking at Poker Atlas it seemed that, if I wanted a tournament, there was only line place to go. And it was next door. I have to admit, this is one time when a desire to play poker may have overwhelmed common sense. The details in Poker Atlas weren’t up to date or complete. It listed 20 minute blind levels. They were 15. It didn’t mention that the blinds doubled each level. I should have been suspicious when the guy at the front desk couldn’t tell me how many alternates (the room was full of cash tables), but I forked over my buyin, then I looked at the structure and realized that we were in level 5, which meant blinds were already 200/400 and I wasn’t the first person on the list. I was all-in almost every hand throughout the game. People started complaining, or commenting, on my preference to enter the hand for maximum value, but as long as I was in the 10BB zone—and the aggressive structure sort of guaranteed that for a long while—that was my main move. I won my showdowns. We got down to the money in level 10 (T8K/T16K). With 33 entries in the tournament, there were just over 10BB between the five of us. I’d been in the chip lead after knocking all but a couple of blinds out from the former chip lead, but he came back and had been mopping up while I’d been relatively card dead. At 4-handed, I got 8x8x in the BB, the chip lead limped, I shoved, and he called with 6x9x, catching a nine to put me out. This was one of the rare instances I didn’t leave a tip. The final dealer was the guy who’d been at the desk and didn’t know how many alternates there were when I was asking (and apparently couldn’t be bothered to find out). I hung around the table for several minutes while the floor manager was at the front desk, dealing with a line of people looking to get into cash games, and I asked the dealer if he’d already let the floor man know I needed to be paid. The dealer told me he’d be over as soon as he got done helping customers. I said, somewhat snottily: “What? Am I not a customer?” and the dealer just sort of looked at me with a fat grin. The floor man came over a minute or two later and hinted broadly about tips, with an envelope marked “STAFF” on top of the payout envelopes, but I just took my money and walked to the door. Seventy-five minutes. 4th of 33 entries. +178% ROI. Another couple hours of sleep. Some more wrestling with the Quad wifi to try to get a work project handled, email answered, etc., mostly unsuccessfully. Then I packed things up, checked out and went back to the sweet, sweet Orleans, the source of most of my success this trip. …so I lost my buy-in in an hour, more than erasing the 4-8 gain from the night before. I went and got some breakfast, sat back down, and made at least enough money so that I came out $25 ahead for cash games at the Orleans (there’s still the Quad to deal with). I got off to a good start in the ROSE game, coming in just before break, in Stud 8/B, which is one of my better games, I think (or maybe it’s just one of everyone else’s worst games). I chopped the first hand I played, then had rolled-up nines with a nine showing, and the case nine showing for another player. I picked up an ace on fourth street, then got another on seventh and bet my full house into the inferior full house of a player on my left. It started off quite well. Hit some rocky patches, though, and eventually got it in an Omaha 8/B round well before the money with a good hand and a great draw that never got there. Three hours. 18th of 45 players. And that’s it for my 2014 Vegas summer. For the first time in 4 years, no WSOP event. No visit with my bracelet-winning buddy (who didn’t even fly to Vegas this summer). Some small cashes, but the biggest win was the satellite seat. 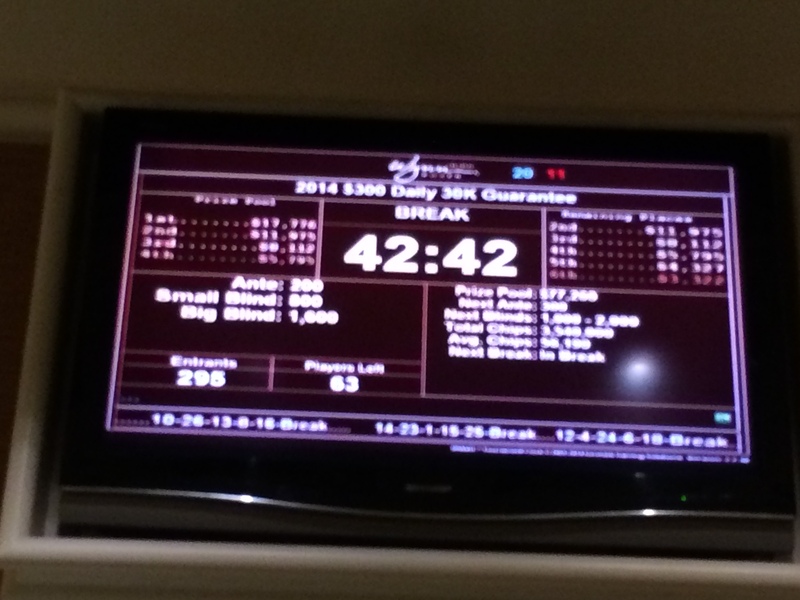 Over the two trips, I played sixteen live tournaments and cashed four (including the satty). Didn’t make back my expenses, but if the queens had held at Planet Hollywood and I’d made 7th or better instead of 16th or I’d managed to even min-cash in the Venetian $800K, that would have been another story. The big event at Wildhorse is coming up this weekend. If I can swing it, I’d like to make a trip down to California in mid-August for the end of Hustler Casino’s Grand Slam of Poker, the start of the Legends of Poker at The Bike, and the Ante Up World Championship at Thunder Valley. Then, of course, the Bay 101 Open‘s just a couple weeks later and in a day’s drive of Portland…. Hope everyone has a productive and profitable season. And, indeed, the game got off to a great start. By the end of the second level, I’d more than doubled up. 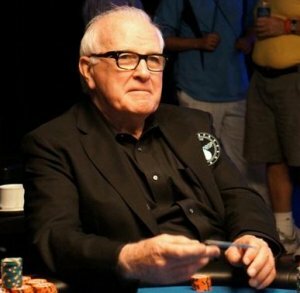 There was another Portland-area player on the table (named Art), who was passing the time after eking his way through Day 1 of the WSOP Main Event, and together we were passing the table chip lead back and forth. I like to think that I was doing it by skill. Art, on the other hand misread his KxTx against a player with a suited AxKx, and only survived by hitting a two-outer on the river to make the trips that didn’t complete a flush; then he played KxTx again and flopped KxKxKx against AxAx, who thought maybe the Ax on the turn gave him the better hand (it didn’t); then Art’s QxTx hit ten on the river to beat my KxQx on a queen-high flop (I wasn’t all-in). Still, I got to the first break just a few thousand down from my peak, at T25K. I was playing fairly tight, making laydowns that I came to regret at least three times. I lad down KxJx twice to raises from early position, with the flop on the first one running out KxKxJx and two kings on the second, which would still have been the winning hand even if it wasn’t a full house. I didn’t lay down 6x6x from BB after a short stack in UTG shoved for the fifth or sixth time. I called him for about a third of my stack after everyone else folded, he had 5x5x and my better pair held. AxAx in the SB with an all-in ahead of me and I shoved, with BB shoving afterward. Queens and jacks, the aces hold, and I had T55K going into break 2. The tournament seated 295 entries after all of the alternates got in, there were 130 left, with 100 to go before the money. The big laydown that probably cost me a cash in the tournament was calling a raise with AxKx. A third player shoved, the original raiser re-shoved, and I folded to let them duke it out since they both had about 2/3 of the chips I had and a loss would have left me critically short. The had was JxJx v QxQx, and a king hit the river. I would have been over T100K and close to ITM chip level if I’d pulled the trigger. Bad fold. I stalled out about that point, without a lot in my hand I could consider playing. Then a table change, and shortly after I get there, I have KxKx in BB. I bet, get two calls, and the flop is king-high, I bet and gain some much-needed chips that I promptly lose with AxKx on the next hand after two jacks show up on the turn and a player shoves over my c-bet. By the dinner break, I was down to T41,500, coming back to about 20BB. Across from me at the table is an older gent (73, he’s telling one of the other players) who’s been telling poker stories. Then he mentions something about having played in the Big One for One Drop. Both times. With such a limited field, there aren’t many people he could be, and I surreptitiously type into my iPad. And there he is, not just a guy who played the Big One, but a guy who was involved in one of the highlight hands from the first game. John Morgan, guy who can buy into two million-dollar tournaments (without having cashed in the first), playing a game at the Wynn where the total prize pool is less than 10% of the Big One buyin. And, of course, when I raise from a short stack, and shove over his re-raise with A♣8♣ he has KxKx, which knocks me out about 20 spots from the money. Seven and a half hours. 51st of 295 entries. Addendum: the wifi at The Quad is just as dodgy as the HoJo, which is really annoying since Harrah’s owns both the hotel and WSOP.com. As mentioned in my previous post, I’m forgoing the last day of the inaugural WPT500 at Aria. Each of the starting days is playing down to 5% (or less, in some cases where there have been multiple busts on the bubble. The last positions paid are getting $1,250 on a $565 buyin. That’s a 120% ROI for beating all but 1/20th of your flight. The Wynn Classic $30K that ran on 2 July had 245 entries (at $300). 13th place (on the bottom edge of the top 5%) got $1,155–nearly as much cash, more profit, and an ROI of 285%. “Maybe it’s just the bigger field size?”, you might ask. It’s true that larger fields have flatter payouts, as I’ve mentioned before, but one of the biggest fields this year was the WSOP Monster Stack event (#51), with 7,862 entries over two flights (sort of, it was confusing). Folks in the top 6th percentile there (just below position 393) were making $4,670 on their $1,500 entry fee, a 211% ROI, nearly a full buyin (in relative terms) to the WPT500. Argue all you want about rake making it difficult to make a living playing tournaments, making it through half the cashing field and losing an entire buyin because of a top-heavy structure is going to cost you a lot more. So, with the beginning of Day 1C (the last entry day) of the 2014 WSOP, it’s official that I’m not playing a bracelet event during this year’s summer series, after three years of single shots in $1,000 events. Family matters took precedence over my schedule during the first portion of the series, my brief trip down at the end of June didn’t build the bankroll enough (and I didn’t win an online satellite seat). Saturday night’s local $8K at Encore resulted in a min-cash after grinding my way into the money with just 3-10BB for four hours ended with my UTG all-in A♣Q♣ getting re-shoved for a little more by J♦T♦ and both of us called by a big stack in BB with 6♠7♠ (both of us short stacks paired the flop, but the board ran out a spade flush). If that had gone a little differently, I might have tried to get down Sunday night for the last of the $2K Main Event Mega Satellites, but no. That’s not to say I’m done in Vegas this summer, by any means. As a matter of fact, I’ll be back down there in just about ten hours as I write this. The Daily Deepstacks are still running at the Rio. There are a couple more days of $30K events at the Wynn. After looking at the payout structures of the WPT500, I’m passing on trying to get to the Aria tomorrow for the last entry day there. And who knows? There’s a satellite for this year’s WSOP APAC in Australia in October on Thursday, so a bracelet opportunity is still out there.